We carry a vast selection of lamps for your home. 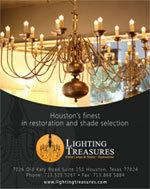 Most of our lamps are created in-house and are unique to Lighting Treasures. We have both antique and modern lamps. Our collection is constantly changing so check back often. Remember we can make almost anything into a table lamp.